WP: International Council for Harmonisation of Technical Requirements for Pharmaceuticals for Human Use - ICH is a project that brings together the regulatory authorities of Europe, Japan and the United States and experts from the pharmaceutical industry in the three regions to discuss scientific and technical aspects of pharmaceutical product registration. The purpose of ICH is to reduce or eliminate the need to duplicate the testing carried out during the research and development of new medicines by recommending ways to achieve greater harmonisation in the interpretation and application of technical guidelines and requirements for product registration. Harmonisation would lead to a more economical use of human, non-human animal and material resources, and the elimination of unnecessary delay in the global development and availability of new medicines while maintaining safeguards on quality, safety, and efficacy, and regulatory obligations to protect public health. https://en.wikipedia.org/wiki/EC50 - refers to the concentration of a drug, antibody or toxicant which induces a response halfway between the baseline and maximum after a specified exposure time. It is commonly used as a measure of drug's potency. The Likely Cause of Addiction Has Been Discovered, and It Is Not What You Think - Addiction - "It's not you. It's your cage. ... the opposite of addiction is not sobriety. It is human connection." "At the end of trial, there was a significant difference in the mean duration of wound healing between the two groups (p = 0.0001). The phenolic compounds and the alkaloid taspine, which exist in Dragon's-blood resin, are probably the main reasons for the wound healing property of this plant. Being natural accessible, safe, and affordable makes Dragon's blood cream, a good choice for addition to the wound healing armamentarium." https://en.wikipedia.org/wiki/Anti-inflammatory - refers to the property of a substance or treatment that reduces inflammation or swelling. Anti-inflammatory drugs make up about half of analgesics, remedying pain by reducing inflammation as opposed to opioids, which affect the central nervous system. https://en.wikipedia.org/wiki/Opioid_receptor - a group of inhibitory G protein-coupled receptors with opioids as ligands. The endogenous opioids are dynorphins, enkephalins, endorphins, endomorphins and nociceptin. The opioid receptors are ~40% identical to somatostatin receptors (SSTRs). Opioid receptors are distributed widely in the brain, and are found in the spinal cord and digestive tract. https://en.wikipedia.org/wiki/Hookah - also known as a waterpipe, narghile, arghila, qalyān, or shisha, is a single or multi-stemmed instrument for vaporizing and smoking flavored tobacco called shisha in which the vapor or smoke is passed through a water basin ‒ often glass-based ‒ before inhalation. From Norman and Tom; Chamomile is great on its own but with a little (3/2) elderflower mixed in is also very nice. There's also premade 'greengrow' in Real Foods that's eucalyptus, hazel leaf, papaya and mint. Coltsfoot is a classic, grows abundantly but maybe best in the springtime. Raspberry leaf is great also (you buy it as loose leaf herbal tea). https://en.wikipedia.org/wiki/Phenazepam - developed in the Soviet Union in 1974 and now produced in Russia and some CIS countries. Phenazepam is used in the treatment of neurological disorders such as epilepsy, alcohol withdrawal syndrome and insomnia. It can be used as a premedication before surgery as it augments the effects of anesthetics and reduces anxiety. https://en.wikipedia.org/wiki/Dissociative - a class of hallucinogen, which distort perceptions of sight and sound and produce feelings of detachment - dissociation - from the environment and self. This is done through reducing or blocking signals to the conscious mind from other parts of the brain. Although many kinds of drugs are capable of such action, dissociatives are unique in that they do so in such a way that they produce hallucinogenic effects, which may include sensory deprivation, dissociation, hallucinations, and dream-like states or trances. Some, which are nonselective in action and affect the dopamine and/or opioid] systems, may be capable of inducing euphoria. Many dissociatives have general depressant effects and can produce sedation, respiratory depression, analgesia, anesthesia, and ataxia, as well as cognitive and memory impairment and amnesia. binaureal tones; 8800hz, 4400hz/ 5440hz? ish. others? https://en.wikipedia.org/wiki/Esketamine - the S(+) enantiomer of the drug ketamine, a general anaesthetic. Esketamine acts primarily as a non-competitive NMDA receptor antagonist, but is also a dopamine reuptake inhibitor. As of August 18, 2016, it is in phase III clinical trials for treatment-resistant depression (TRD). Esketamine is approximately twice as potent as racemic ketamine. It is eliminated from the human body more quickly than arketamine (R(–)-ketamine) or racemic ketamine, although arketamine slows its elimination. A number of studies have suggested that esketamine has a more medically useful pharmacological action than arketamine or racemic ketamine. Esketamine inhibits dopamine transporters eight times more than arketamine. R-ketamine: a rapid-onset and sustained antidepressant without psychotomimetic side effects. - Yang C1, Shirayama Y1,2, Zhang JC1, Ren Q1, Yao W1, Ma M1, Dong C1, Hashimoto K1. Transl Psychiatry. 2015 Sep 1;5:e632. doi: 10.1038/tp.2015.136. "Although the efficacy of racemate ketamine, a rapid onset and sustained antidepressant, for patients with treatment-resistant depression was a serendipitous finding, clinical use of ketamine is limited, due to psychotomimetic side effects and abuse liability. Behavioral and side-effect evaluation tests were applied to compare the two stereoisomers of ketamine. To elucidate their potential therapeutic mechanisms, we examined the effects of these stereoisomers on brain-derived neurotrophic factor (BDNF)-TrkB signaling, and synaptogenesis in selected brain regions. In the social defeat stress and learned helplessness models of depression, R-ketamine showed a greater potency and longer-lasting antidepressant effect than S-ketamine (esketamine). Furthermore, R-ketamine induced a more potent beneficial effect on decreased dendritic spine density, BDNF-TrkB signaling and synaptogenesis in the prefrontal cortex (PFC), CA3 and dentate gyrus (DG) of the hippocampus from depressed mice compared with S-ketamine. However, neither stereoisomer affected these alterations in the nucleus accumbens of depressed mice. In behavioral tests for side effects, S-ketamine, but not R-ketamine, precipitated behavioral abnormalities, such as hyperlocomotion, prepulse inhibition deficits and rewarding effects. In addition, a single dose of S-ketamine, but not R-ketamine, caused a loss of parvalbumin (PV)-positive cells in the prelimbic region of the medial PFC and DG. These findings suggest that, unlike S-ketamine, R-ketamine can elicit a sustained antidepressant effect, mediated by increased BDNF-TrkB signaling and synaptogenesis in the PFC, DG and CA3. R-ketamine appears to be a potent, long-lasting and safe antidepressant, relative to S-ketamine, as R-ketamine appears to be free of psychotomimetic side effects and abuse liability." Psychological effects of ketamine in healthy volunteers - Phenomenological study. E. Pomarol-Clotet, G. D. Honey, G. K. Murray, P. R. Corlett, A. R. Absalom, M. Lee, P. J. McKenna, E. T. Bullmore, P. C. Fletcher. The British Journal of Psychiatry Jul 2006, 189 (2) 173-179. "Ketamine induced a range of perceptual distortions, but not hallucinations. Referential ideas were seen in nearly half the sample. There were only mild and infrequent ratings on the thought disorder scale. Affective flattening and alogia were seen in some volunteers. "Ketamine does not reproduce the full picture of schizophrenia. The main point of similarity concerns referential thinking. Phenomena resembling negative symptoms are also seen, but the distinction of these from the drug’s sedative effects requires further elucidation." Journey through the K-hole: phenomenological aspects of ketamine use. YouTube: Ketamine and Next Generation Therapies - Carlos Zarate, M.D. https://en.wikipedia.org/wiki/Psychonautics - refers both to a methodology for describing and explaining the subjective effects of altered states of consciousness, including those induced by meditation or mind altering substances, and to a research paradigm in which the researcher voluntarily immerses himself or herself into an altered state by means of such techniques, as a means to explore human experience and existence. 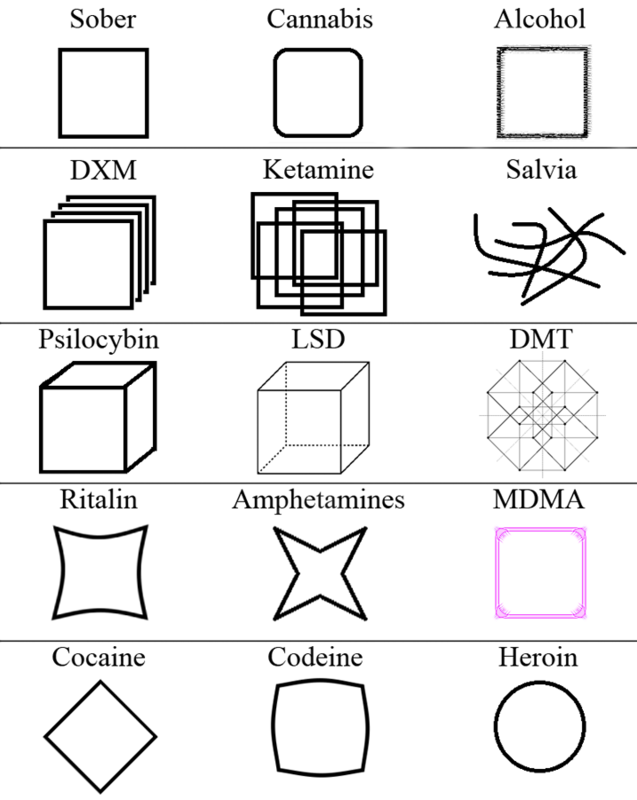 https://en.wikipedia.org/wiki/Dimethyltryptamine - N,N-Dimethyltryptamine (DMT or N,N-DMT) is a psychedelic compound of the tryptamine family. Since DMT resembles the basic structure of neurotransmitters, when ingested, DMT is able to cross the human blood-brain-barrier, allowing it to act as a powerful hallucinogenic drug that dramatically affects human consciousness. Depending on the dose and method of administration, its subjective effects can range from short-lived, milder psychedelic states to powerful immersive experiences; these are often described as a total loss of connection to external reality and an experience of encountering indescribable spiritual/alien beings and realms. DMT is structurally analogous to the neurotransmitter serotonin (5-HT) and the hormone melatonin, and furthermore functionally analogous to other psychedelic tryptamines, such as 5-MeO-DMT, bufotenin, psilocin, and psilocybin. https://en.wikipedia.org/wiki/Psilocybin - Prodrug of psilocin. In general, the effects include euphoria, visual and mental hallucinations, changes in perception, a distorted sense of time, and spiritual experiences, and can include possible adverse reactions such as nausea and panic attacks. https://en.wikipedia.org/wiki/Ayahuasca - also yagé, a psychedelic brew made out of Banisteriopsis caapi vine alone or in combination with various plants. It is either mixed with the leaves of dimethyltryptamine (DMT)-containing species of shrubs from the genus Psychotria or with the leaves of the Justicia pectoralis plant which does not contain DMT. It has been reported that some effects can be felt from consuming the caapi vine alone, but that DMT-containing plants (such as Psychotria) remain inactive when drunk as a brew without a source of monoamine oxidase inhibitor (MAOI) such as B. caapi. YouTube: Present! - Ayahuasca - Psychologist and consciousness researcher, Stanley Krippner, offers unique insights into the sacred Amazonian medicinal drink, Ayahuasca. https://en.wikipedia.org/wiki/Tabernanthe_iboga - stimulates the central nervous system when taken in small doses and induces visions in larger doses. the bark of the root is chewed for various pharmacological or ritualistic purposes. also used to treat substance abuse disorders and depression. https://en.wikipedia.org/wiki/Bwiti - a spiritual discipline of the forest-dwelling Babongo and Mitsogo peoples of Gabon (where it is recognized as one of three official religions) and by the Fang people of Gabon and Cameroon. Modern Bwiti incorporates animism, ancestor worship and Christianity into a syncretistic belief system. Bwiti practitioners use the psychedelic, dissociative root bark of the Tabernanthe iboga plant, specially cultivated for the religion, to promote radical spiritual growth, to stabilize community and family structure, to meet religious requirements, and to resolve pathological problems. https://en.wikipedia.org/wiki/Racetam - a class of drugs that share a pyrrolidone nucleus. Many, such as piracetam, but not all, are considered nootropics. Some such as oxiracetam and phenylpiracetam are also stimulants. Others such as levetiracetam and seletracetam are anticonvulsants. This page was last edited on 14 April 2019, at 22:18.